Description: A classic Phil Woods album (originally released by Pathe - EMI in France) meticulously reproduced and lovingly reissued by Atelier Sawano of Japan! Faced with diminishing opportunities in the U.S. to play and record jazz in the 1960s, saxophonist Phil Woods moved to Europe in the spring of 1968. 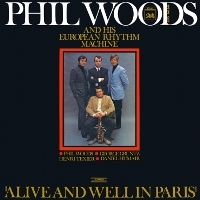 Based in Paris, he quickly formed the now-legendary group called Phil Woods and His European Rhythm Machine, with Swiss pianist George Gruntz and two Frenchmen, bassist Henri Texier and drummer Daniel Humair. Their first record, Alive And Well In Paris was recorded in the same year for the Pathe label. Based on bebop and having absorbed modal jazz and even jazz rock, this group was at the cutting edge of jazz at the time, and their incredible power and excitement are awe-inspiring. The dramatic and powerful "And When We Are Young," written by Woods in dedication to Robert Kennedy who had been killed earlier that year, is alone worth the price of admission. Considered as one of the best records made by the alto sax virtuoso, this European album has been reissued many times, but Yoshiaki Sawano, founder of the Japanese independent jazz label Atelier Sawano, was not satisfied with any of them, and decided to produce the ultimate vinyl reissue. His attention to detail is reflected in the faithful reproduction of the original jacket as well as the impeccable sound quality. Recorded in Paris on November 14 and 15, 1968.